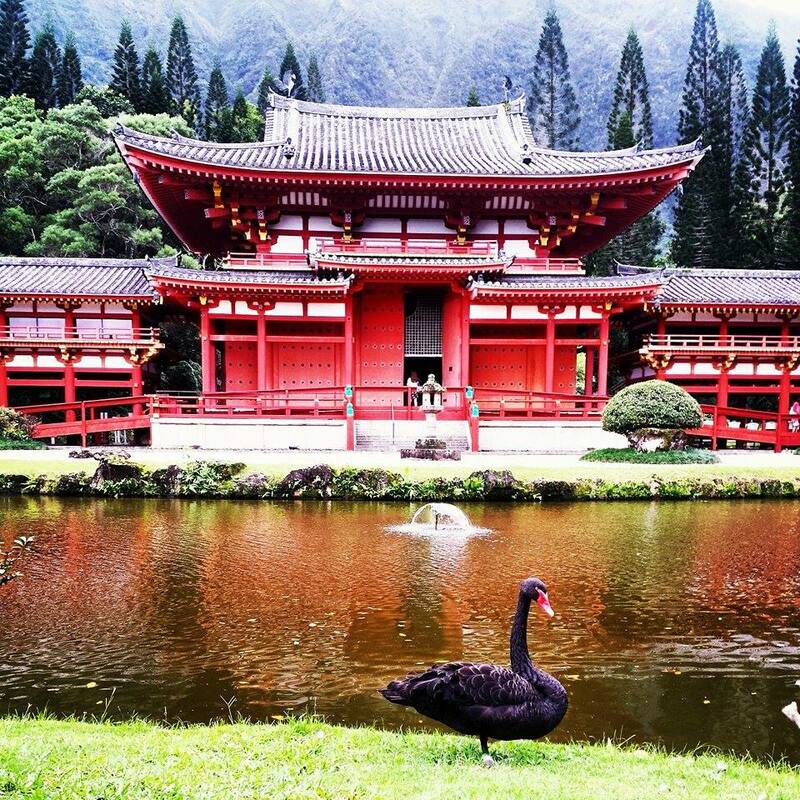 It’s almost unbelievable that a person can grow up on the Hawaiian Island of Oahu and never have visited the Valley of the Temples, much less the Byodo-In Temple. I mean, at first sight of the Temple in a picture, you think, “Yes, I would go there at least once.” How could you not? Well, I hadn’t. And I’m 27 years old. So, finally, it just seemed like the right day to do so. My man, let’s just call him Bryan, and I figured it would be a relaxing, peaceful stroll through this exact replica of the 950-year-old temple in Uji, Japan. This peaceful walk turned into a hilarious and lively jaunt. First of all, besides walking straight toward the temple, which is quite the dramatic pop of color amidst the Ko‘olau Mountains, the first structure you come to is an enormous bell-shaped gong, the Bon-sho (or Sacred Bell), complete with a huge log that the villagers used in Beauty and the Beast to knock down the door of Beast’s castle. Anyway, everyone and their children are lined up to pull the shu-moku back and let it glide into the Sacred Bell to supposedly spread the eternal teachings of Buddha aka make a fun sound and take a cool profile pic of your cultural travels into Kaneohe. There’s also, of course, a little collection slot for those who wish to pay the deities for more assured prosperity. Ah, reminds me of good ol’ China. As much as we were expecting the rest of our tour of the temple grounds to be relaxing and peaceful, the quirky bits of this location were undeniable. A black swan thwapping every one of those koi right in their koi faces. 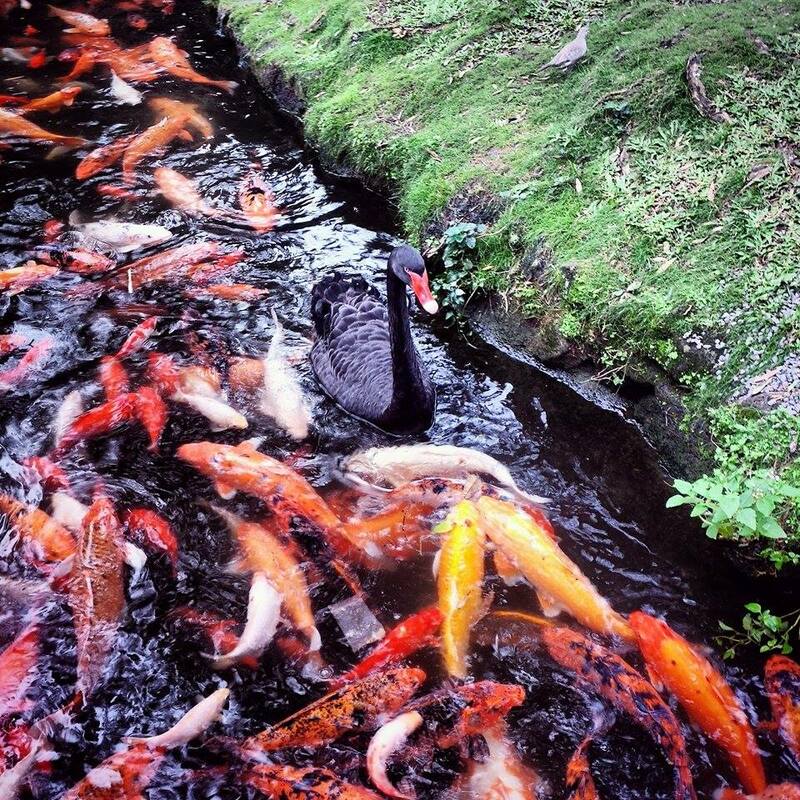 I was expecting to see black swans, sure, but I was not expecting one giant mass of koi to swarm like a cloud of flies. To me, it took away from their individuality to see them all en masse like that. Oh, and back to the black swan—he can be seen here not swimming, but walking on all these fish back and forth because 1) there are that many in a cluster, and 2) he’s the one with legs. Like a boss. There were also people nearby feeding the dirty grey doves. Gross! All hope was not lost, though. We did manage to find a peaceful moment when we walked into Hoo-do, the Phoenix Hall, home to Amida, the golden Buddha (not a replica from the original Byodo-in Temple). 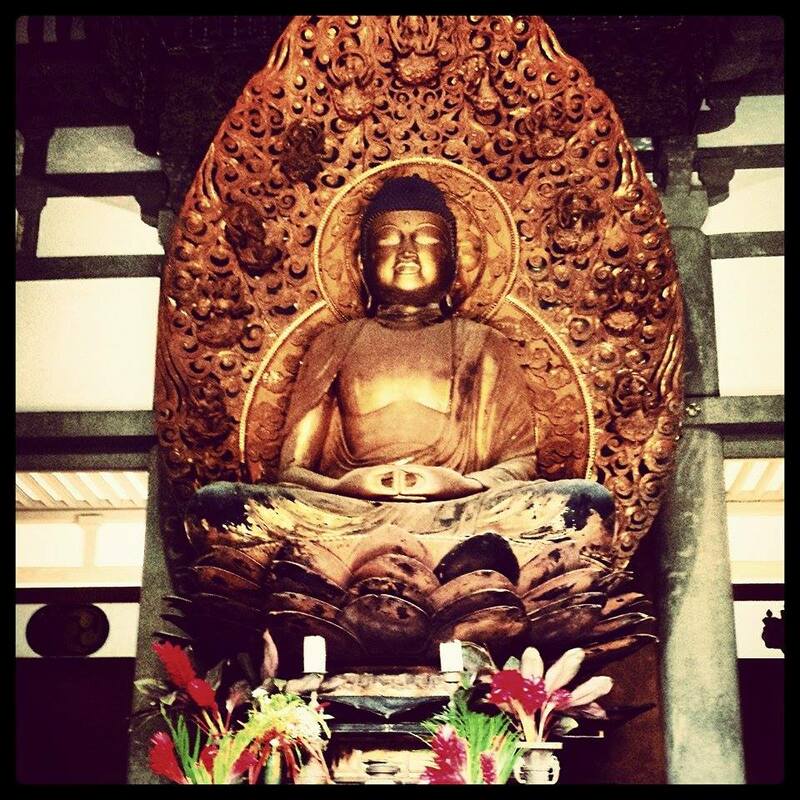 The golden Buddha, Amida. Supposedly there’s no other like it in the world. All are welcome to worship at the Temple, and a palpable spiritual energy could be felt when we entered this room. Individuals were lighting incense and giving prayer while we gazed upon the ornate sculptures surrounding Amida depicting “Boddhisttvas,” or enlightened beings, engaged in musical and merry activities. We stepped out of Phoenix Hall and toward the gift shop (the main attraction, to me) and found this peacock, mimicking the pose of the statue just behind him. We also found a nearby sign requesting folks not harass the peacock as he just recently recovered from a broken leg. 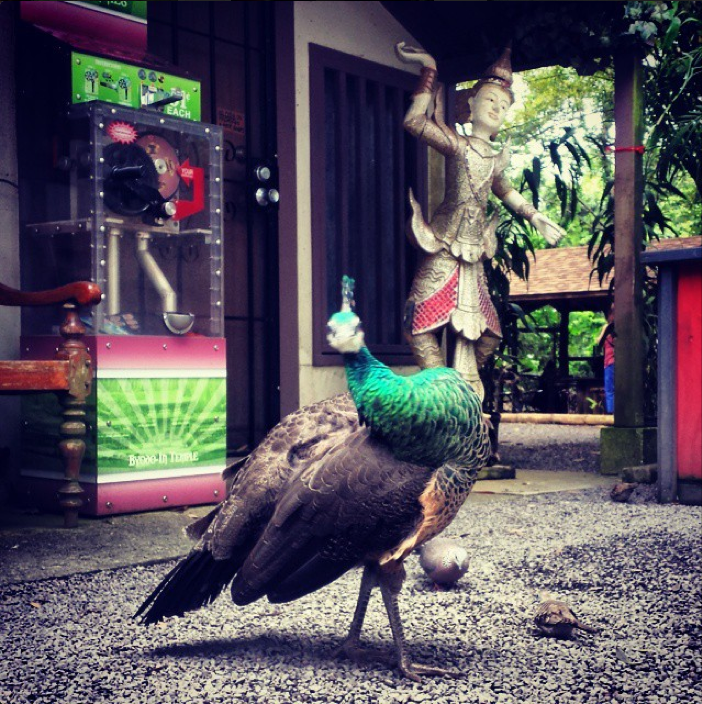 I guess Byodo-In Temple can get a little wild for all its inhabitants, not just the koi. We took a quick stop at the rise of the property to the Meditation House, where we were quickly discovered by so many mosquitoes that I involuntarily screamed before I got the hell out of there as fast as possible. This is one photo opportunity I’m sure my date regrets missing. Not much to see or do here, but it was a lovely, romantic stop and the Ko‘olau Mountains surrounding are breathtaking. I’m sure we’ll be back again, with mosquito repellant. Previous Post The Forbidden City: Meh. Good shots; my favourite is the one of the Byodo-In temple exterior. Mahalo! The temple really does all the work for you. Got a bit lucky with the swan. Thanks for visiting! Beautiful! OMG I think I just saw this place on an old episode of Magnum PI! Ha. It really is spectacular though. Hahaha, Magnum PI! Tom Selleck is still our frontman for anything Aloha Shirt related.